Are you trying to become more energy efficient in your home but a little unsure of how to start? Reducing the amount of energy you use at home will not only make your bills cheaper, it will also go that little way to protecting the environment around us. Follow these seven easy tips and you’ll start to become energy efficient in no time. It’s easy simply to use the remote to turn off the TV before bed, but leaving appliances on standby means they are still using electricity and wasting energy. So, before you go to bed, think about your energy efficiency and switch it off at the main power source. That goes for your laptop and mobile phone being continually left on charge unnecessarily too. It’s quick, easy and will save you loads of energy. Reducing your room temperature by just 1°C could cut your heating bills by ten percent and in most cases will save around $100 each year. Also, if you have a programmer, simply set your heating and hot water to come on only when required rather than all the time. You may have a few dirty plates and dishes after dinner, but not yet enough for a full load in the dishwasher. Of course you can load them in when you tidy the kitchen but don’t stick it on until you can completely fill it up. One full load will use much less energy than two half loads meaning you’ll expend much less energy. Not only will these produce the same amount of light as a standard bulb, they’ll only use a fraction of the electricity which could save you as much as $75 per year. If you have incandescent bulbs anywhere, replace them with compact fluorescent bulbs. They use about one third the power of an equivalent incandescent bulb, and are compatible with existing light fittings. One of the biggest ways to make your home much more energy efficient is by installing insulation to stop heat escaping. It’s relatively easy to install and could make huge savings every year on your energy bills. Have a look around your home for drafts around doors, windows and electrical sockets. If you find any drafts, get them sealed up! There is no point in lighting an office if there is nobody in it! You could ask people to turn out the lights when they leave a room, but if you really want to make sure, think about putting in motion sensors. These will turn out the lights when no one is in the room, and turn them back on automatically when people come back in. You can buy light switches with built-in sensors, which is an easy way to start saving money! The days of electricity monopolies are long gone, and there are many suppliers to choose from. There are comparison sites on the web to help you find the cheapest supplier, and switching is relatively easy. Check rates regularly and be prepared to switch again if your supplier is no longer competitive. As you can see, following these quick and easy tips will start to save you money and cut your bill in no time. So, what kinds of things have you done to increase your energy efficiency? Please share. We turn off our hot water heater when we leave on vacation. Doesn’t save a lot, but every bit helps. @No Debt MBA. That is such a great idea. We have been good with turning off everything else when we travel but I forgot about the water heater. Definitely going on the list for the next trip. Thanks for the tip. I use a setback thermostat. During the summer, the thermostat is set at 78 degrees and in the winter, the thermostat is set at 65 degrees until an hour before we get home. Then the thermostat automatically lowers the temperature to 75 degrees (summer) and raises it to 68 degrees (winter). @Krant cents. Good for you. We also have a programmable themostat and we really like it. We are getting them installed in our basement this year for our electric heat. The great thing is they really don’t cost a lot and yet they make such a difference. Thanks for doing your part. We’ve done a lot of things to improve energy efficiency over the years — everything from switching to CFLs, to insulating the attic, to replacing doors and windows. They’ve all made a big difference. @Jackie. Thanks for doing your part and making some changes in your home. Insulating your attic is one of the best things you can do for preventing energy loss. And replacing windows and doors too. Glad to hear you found a way in your budget to make these important renovations. 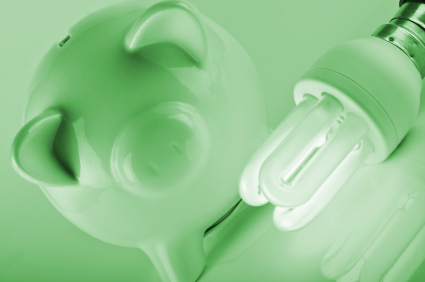 Using energy efficient lighting not only help save money but also save the environment. Also, having the optimal thermostat setting can have a dramatic impact with energy savings. @Spruce up your finances. Absolutely. Those two changes may not seem like much but they really add up. We invested in programmable thermostats and we love them. Thanks for doing your part. @Eliza. It’s amazing what we could go and buy to be more green hey?! Just do what you can as you can and all of those small changes will add up.